The portrait of Anne Frank, entitled ‘Let me be myself’, emphasizes the importance of fully respecting everyone’s identity. With the portrait, the artist relies on recurring themes in his work, such as world peace, interdependence and mutual understanding. Eduardo Kobra makes colorful portraits of iconic figures that he paints in giant format on apartment buildings and factories worldwide. The Dalai Lama, John Lennon, Nelson Mandela, Martin Luther King and Ghandi were previously portrayed by him. The rich color palette reminds of a kaleidoscope and the murals depict life stories of peace, hope and courage. As an official artist of the Olympic Games in Rio de Janeiro, Kobra made the work ‘Todos somos um’ (We are all one). “Kobra’s project in Amsterdam has resulted from a visit to São Paulo earlier this year by mayor Van der Laan and is part of the cooperation between both cities,” says Joelke Offringa, who has initiated the project as chairman of Instituto Plataforma Brasil and has Kobra concerned. The project is a close cooperation between the City of Amsterdam, Instituto Plataforma Brazil, Street Art Today and the NDSM Foundation. The location in Amsterdam North has been deliberately chosen. 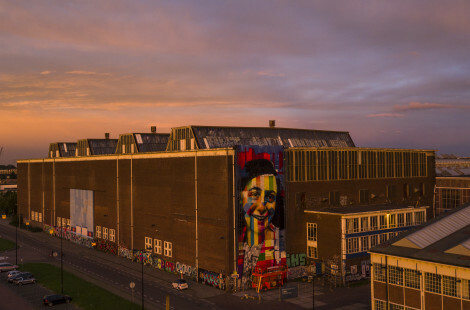 “The NDSM site has an international reputation as an artistic, innovative and experimental detached place, which expresses the message of freedom and courage Kobra in his work coincides with the location,” says Peter Ernst Coolen, who on behalf of Street Art Today has taken full production in Amsterdam Has organized. Together with his team, Kobra is currently working hard to complete ‘Let me be myself’. For the work of 240 m2 more than 450 aerosol cans and 35 liters of paint are required. On Sunday, October 2, the portrait is ready. São Paulo and Amsterdam have been working together since 2012. During the last visit by Mayor Van der Laan in June 2016, a tribute to Johan Cruijff was organized at the Cruyff Court in São Paulo. Thanks to this Dutch football icon, 300 Brazilian children now have a safe place where they can go and get a good education. Joelke Offringa of Instituto Plataforma Brasil has asked Eduardo Kobra during the tribute to realize a permanent memorial to Johan Cruijff. Kobra will make a mural with his portrait in March 2017, one year after Johan’s death.